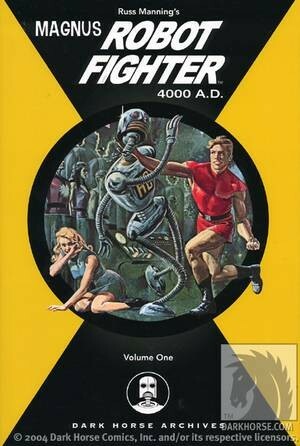 It may have been enjoyable for fans, but in 1979 series co-creator Pat Mills found crafting stories to suit the approach of a rotating schedule of artists challenging and work intensive, so had often said that no matter how fondly remembered the ABC Warriors were, the series wouldn’t be revived. 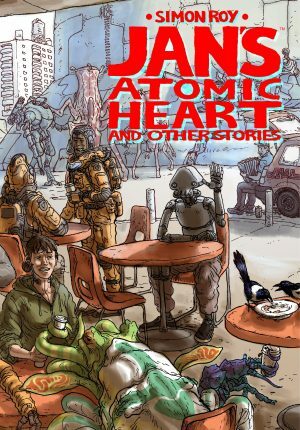 It seemed the stories now collected as The Meknificent Seven would remain an isolated triumph, so it came as a big surprise to 2000AD readers in 1988 when the characters returned. Mills’ inspiration came in the form of two as then unpublished artists, SMS (Simon Short) and Simon Bisley, then so little known he was credited as ‘Steve Bisley’ for his first contributions. 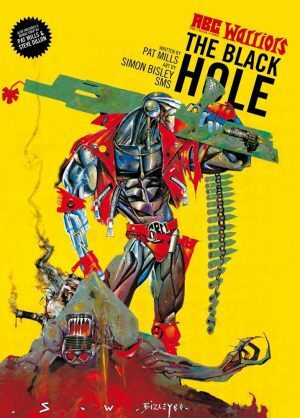 At that time Bisley hadn’t drawn comics, only illustrations, and his strengths are a fantastic conceptual mind and enormous energy, while the actual panel to panel continuity is almost non-existent and his sense of human anatomy is woeful. His later fame came from painted art, but he’s equally wild and enthusiastic in black and white. 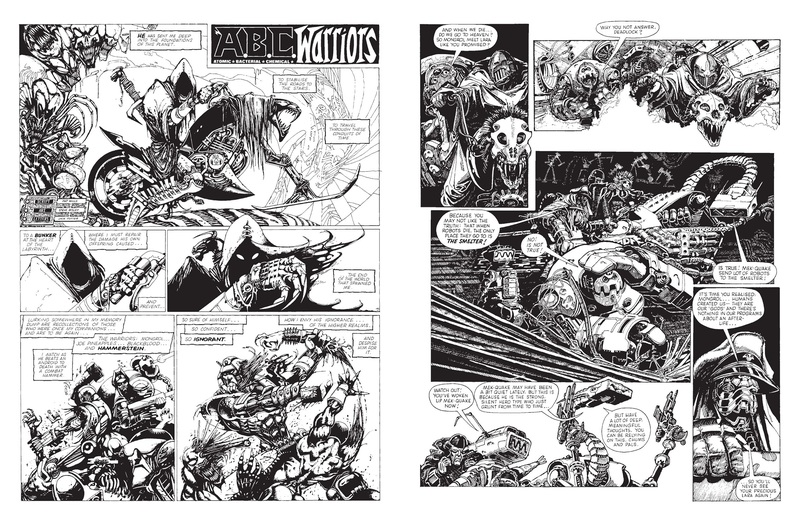 It’s not difficult to imagine Bisley engraving the pages with his pen as he slashed lines of ink across, then stopping to noodle obsessively at some robotic detail. 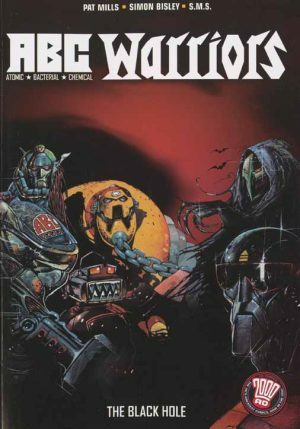 SMS’s work was more restrained, technically far better and equally rich in detail, an appealing fusion of 1970s Heavy Metal style with traditional British comic sensibilities worth looking at again, but it was Bisley’s enthusiasm the fans responded to. 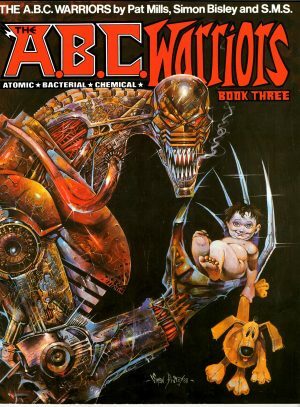 Mills had reintroduced the ABC Warriors into his Nemesis the Warlock chronology, and they pick up from there, a revised team sent into the Time Wastes for nebulous purpose. 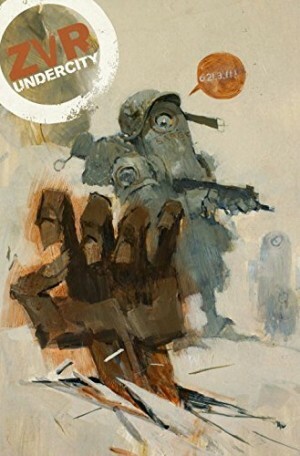 Mills includes the wild card of Terri, a human, but the ABC Warriors otherwise remain a bunch of incompatible robots thrown together, with considerable tension generated via conflicting personalities and motives. General Blackblood has no love for his team-mates, a residual few circuits of his original Volgon programming still sparking, and mystical robot Deadlock’s agenda is to spread Khaos, and he’s unconcerned about how his methods impact on others. 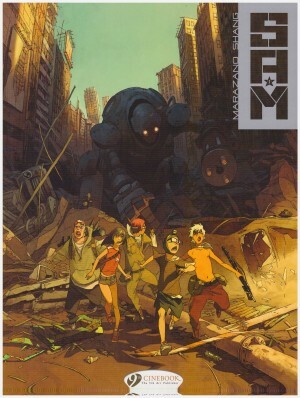 Mek-Quake, the comedy relief in Mills’ earlier Ro-Busters strip is co-opted and treated seriously, but really just making up the numbers, while Ro-Jaws is also used, his foul-mouthed and anarchic personality a necessary contrast to the miserably introspective natures of so many of the other robots. The actual plot is nonsense, wooly unexplainable concerns about time particles leaking into the real world delivered with enough gravitas to convey this is really bad. Via some method these particles can prolong life, and that sort of thing’s certainly not to trickle down beyond the entitled to the hoi poloi. Mills overcomes that by throwing threat after threat at the team, and switching the narrative voice between them, establishing some personalities and refining others. There’s room for a few rants about society, sadly still relevant today, the most effective allegory concerning the greatest robot ever created and their downfall. 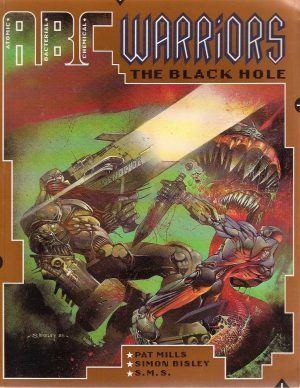 Unlike the necessarily episodic nature of the first ABC Warriors run, Mills does have a bigger picture in mind, and his re-boot proved extremely successful, generating one story arc after another for what became a changeable cast. 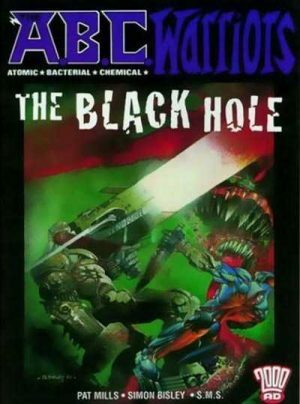 Originally issued in 1989 by Titan Books as The ABC Warriors Book Three, The Black Hole was reprinted by Rebellion in 2011, and is also available with those earlier stories as the first Mek Files. Khronicles of Khaos is next.